Good morning everyone! I hope you are having a productive and smooth prep day as we head into Shabbat. I wanted to share a happy accident with you today that you just might find useful for Purim. My daughter Holly was helping me make pizza last night. She has a wonderfully adventurous spirit when it comes to baking. So she mixed the dough and I helped her finish kneading it. We divided it into 32 pieces because we were making pizza pockets. I press the dough into circles with my tortilla press , love that thing! Well, when I put in some sauce and cheese and tried to fold it in half, I discovered that it just was not happening! The dough was too stiff and wouldn’t mold into the shape I needed! It was like trying to make a pocket with cardboard. But I got an idea! 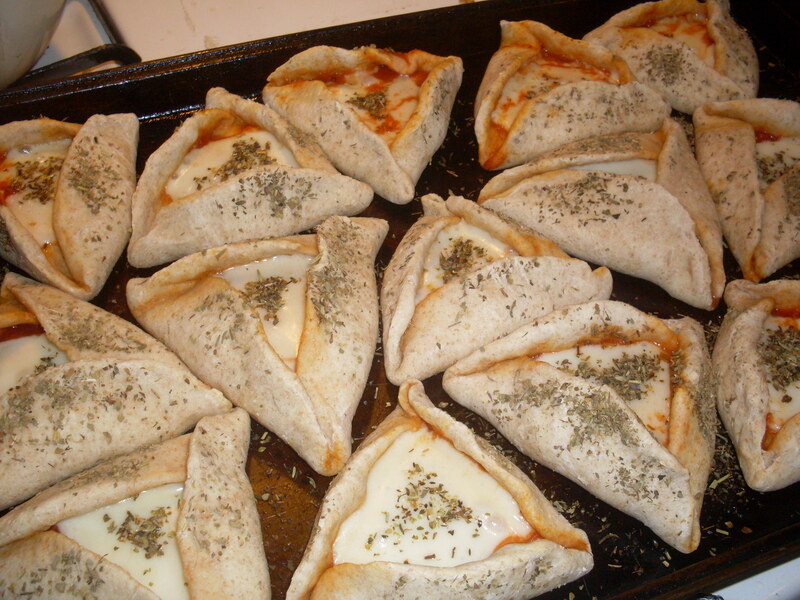 What if we made pizza hamantaschen? Well, we set to work, and it turned out to be a wonderful idea, and tasty too! Mix the dry ingredients including tallow if using. I squeeze the tallow with my fingers to break it down and mix it with the flour. Mix and knead into a nice smooth dough ball. This batch will make 16. Divide into balls and either roll or press into about 5 in. circles. Put a circle of dough on the cookie sheet. Add 1 t of spaghetti sauce in the middle of the circle. Do not put any more. Add two small squares of sliced mozzerella cheese on top of the sauce. Fold one side of the circle in over the sauce and cheese. Fold the next third over. Fold the final third and tuck one of the corners under to give a pinwheel effect, or pretend you are closing the top of a cardboard box and are tucking the flaps in so they stay shut. Pinch the corners a bit to help seal the dough. I think we will add this recipe to our Purim menu. Have a wonderful Shabbat! And don’t forget to enter our giganourmous giveaway! Even if you already entered, there are some entries you can earn everyday. Psst: Evonne told me she just added a surprise gift to the bundle. What an awesome accident… however this could truly be providence! 🙂 Shabbat Shalom!